Every once in a while a piece of art like the one above will stop me in my tracks. We at TWE are art lovers, and, as you might have guessed, are particularly fond of whimsical pieces that make you chuckle and wonder. One such artist caught our eye at the Sausalito Art Festival this year. 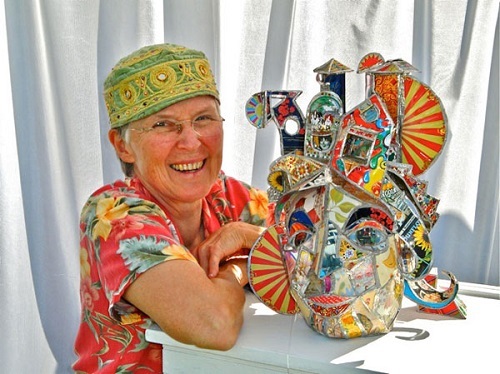 Kathy Ross calls herself a mixed media sculptor. To get an idea of just how mixed her media is, think cereal boxes, wooden coasters, tons of maps, cookie tins, broken jewelry, zippers, noodles from the swimming pool and mountains of found objects.